Graceful Charity remains one of the best spells in the game, even as it will be banned forever baring an edit. Draw 3 cards, then discard 2 cards is too powerful, even back then when the card pool was so much smaller than what it is now. Too many decks would be broken by this. Burning Abyss and Shaddoll would get a tremendous boost from this, as would any deck the revolves around putting something in the grave. With the graveyard a key part of the game now more than ever, this card would be a tremendous weapon to ANY player. Any player, any deck will take a draw 3, even if they have to ditch 2. Even in a top-deck war, this card can get you a card, it will always equal itself out, but to go through your deck with the ease it allows, there’s rarely been another card like it. It has no specific deck to be played, any deck and every deck played it and still would. If you didn’t have it, you had to get it. If you couldn’t get it, it sucked to be you. No. Just no. Draw this card you win, don’t draw it you lose. Graceful Charity would need too much errata to come back so it never will. It activates too many cards and causes too much advantage. This will forever be banned. There were several options for Throwback Thursday I wanted to go for, but I ended up choosing one that went well with the Danger! cards we looked at last week and this week, even though it is banned, this card is so good that Danger! got its own version of it. The card I am talking about is Graceful Charity. Graceful Charity is a simple Normal Spell that lets you draw 3 cards then discard 2. Yeah, pretty easy, yet really absurd. First off, naturally this is a one-for-one or in this case a three-for-three, but there are so many effects that can trigger off Graceful Charity it isn’t even funny. Burning Abyss is a good example of an archetype that would love this card to discard something like Graff, Cir, Farfa, Scarm, or Fiendish Rhino Warrior just to name a few. 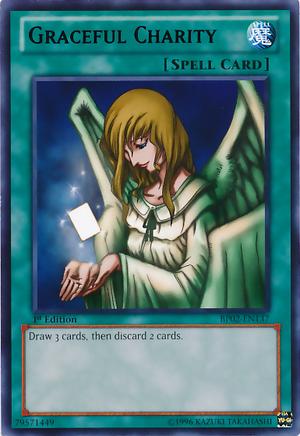 Dark Worlds would also love this to discard cards like Snoww, Beige, Grapha, Goldd, Silva, Broww, and any other Dark World you can think of. Like I said, the Danger! monsters love this card as they have their own archetypal version that is very limiting compared to the original version. Even if you don’t play a deck with GY effects, you are still seeing 3 brand new cards and getting rid of the 2 worst ones. This card is as good as Pot of Greed, which is also banned. Some cases this is the preferred draw card and in others Pot of Greed is. What is important to know is that if both were legal, both of them would likely be played in every deck because draw power is just that good and for that, Graceful Charity can NEVER come back unless it gets a harsh errata or something. Art: 3.5/5 Would of been a 4 if it had the Halo like the OCG had. Ahh Graceful Charity. I guess this has to do with the Danger! theme, what with the discarding, and if this were legal as well as Danger! Zone, we could have some trouble. Graceful isn’t quite like Pot of Greed. The latter being a natural +1, Graceful (while should be included in most every Deck, where Pot needs to be in EVERY Deck) isn’t as natural a +1 and needs to be played at the right time, in certain themes, to be having the most advantage from. To try and break that down a little more succinctly, Graceful is better for different themes than it is for others. It needs to be played at the proper time, with the proper cards in Hand, because you aren’t always going to Draw into what you want/need. On the surface, Graceful is just a break even card. (Graceful itself, plus two discards, as well as the three you add to your Hand). The advantage should 110% be in whatever you discard. There are countless themes that do/would make love to Graceful. Graceful can also be successful (more or less, usually less) based on what is (or isn’t available) via the Ban List, as we’ve seen with things like Sinister Serpent, being abused and abused (and eventually) errated. Graceful though, contradictory as it may sound, can be just as lucked into, having been played at the ‘less than ideal’ time (not to be confused with wrong, I’m not saying there are ‘wrong’ times for it to be played) and still just gain mass advantage of it. I feel I honestly did a nice review here, and I’m moderately sad to have used it on a Banned card. It never hurts to show off your intelligence and writing ability sometimes. Thanks for reading. Art: 4/5 No halo…we got to see the Halo on Kids WB for crying out loud, give us a new art with said halo.